June 2010 – Total Vascular Surgery, Inc. 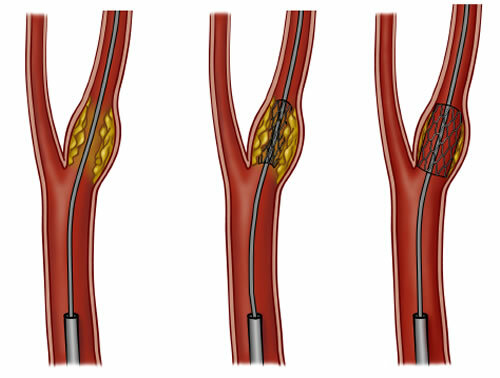 Recently, with a very well conducted, randomized study called CREST (Carotid Endarterctomy vs. Stenting Trial); there are various concerns among vascular physicians. Based on the study, current guidelines for carotid disease may differ in the future. FDA guideline currently dictates carotid endarterectomy as a standard of care for this disease, but carotid stenting may also be considered equally effective therapy in the future. There are several concerns about the CREST results, however. One of the interesting factors was the patient’s age. According to the report, patients aged 65 or younger did better with carotid stenting and older populations did better with open surgery. This is a difficult result to believe but was predicted; prior to full reports on CREST outcomes, preliminary reports identified the octogenarians group (those greater than 80 years-old), as doing poorly with stenting. Another issue with the CREST findings highlighted was the complication rates. Complication rates were similar with both carotid surgery and carotid stenting. The differences being that with stenting, the risk of stroke was much higher, while with open surgery, the risk of heart attack was much higher. Therefore, both groups exhibited similar post procedure co-morbid conditions and complications. Indications for surgery may differ from those for carotid stenting. Based on NASCET (North-America Symptomatic Carotid Endarterectomy Trial), 70 % or more symptomatic patients would benefit from surgery. For asymptomatic patients, I would use the same guideline of 70 % or more stenosis to treat surgically. 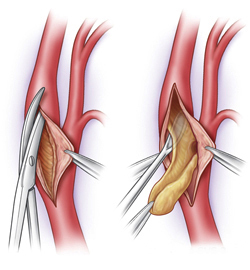 Though, based on the ACAS (Asymptomatic Carotid Atherosclerosis Study), and the ACST (Asymptomatic Carotid Surgery Trial), asymptomatic patients with 60 % or more stenosis would benefit from surgery. Despite all the above criteria and statistical facts, most surgeons will only operate at 80 % or greater stenotic disease. However, morphology of the plaque and underlying atherosclerotic unstable plaque may need earlier intervention. Therefore, we would like to take care of disease at 70 % or higher since risks involved with carotid endartectomy are low. In my opinion, carotid endartectomy should still be the standard of care for carotid disease patients. With my experience, both stroke and heart attack events are extremely low after surgery. Cardiac evaluation and clearance should always be done prior to surgery, as I do with my patients. This certainly minimizes chances of any major cardiac event. In conclusion, I would like to convince primary care physicians and other specialists to emphasize the awareness of carotid disease. Again stroke rate for any stenosis greater than 70 % is significant based on all the above studies mentioned. There is a clear benefit with carotid surgery or stenting to prevent stroke. I usually use both duplex studies and angiographic feature to use in determining when surgery is indicated. Duplex criteria may differ from one to another, but I would like to use velocity and ratio criteria combination to select patients who fall into severe stenosis, generally greater than 70-80 %. Angiogram is almost always indicated to further assess the anatomical feature as well as to confirm the degree of disease or stenosis. As I always do, it is important to review films yourself to ensure an accurate reading. Carotid disease treatment modality may change significantly in the near future. I believe that there is a vital role that carotid stenting can offer. Total Vascular Surgery would like to provide the best options in treatment for carotid disease, including open surgery and stenting in the near future. However, at the present time, only selective patients may be candidates for carotid stenting.